the other breakthrough was ordering more pul from GreenBeans in new zealand. shipping was a bit pricey but the fabric prices were great so it kind of evened out plus my order arrived today and the colours (peach, celery and seaspray, which is a soft turquoise) are exactly as looked on the website and no disco to be seen. such a relief. Hehe, I'm no where near ready for babies but have found these posts really interesting! I had no idea what pul was though and googled it. I have to warn you, though. Layering a cotton print over PUL can be risky. If the pattern you've worked out has the waterproof PUL rolling towards the insides on the legs, the cotton print can come in contact with wetness and "wick" or leak moisture to the outside in a hurry. 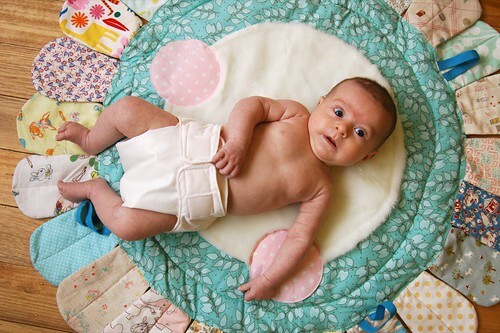 Layering cute fabrics over blah, functional PUL is done all the time, but it's best if it's done over a diaper or cover that is either bound on the edges or serged... to keep that cotton on the outside from becoming damp. To the commenter above me, you can't make your own iron on PUL, but you can find Yahoo Groups where ladies send cute fabrics into a professional joint to get waterproofed. It's a long wait though and print PUL is kind of stiff. Very cute. I agree with the previous commenter about wicking risk though. although mmy sewing is nowhere near as good as yours. I settled for bloomer type over pants with my two. Cloth nappies are so addictive. Having said that, I don't miss the nappy days at all! Basically what Jessica said! She's a wealth of knowledge! There are some fibres that work better being layered over PUL than others - though the ones that are less likely to wick are also a bit thicker so it makes the nappy a bit bulkier. Wigglebums offers a good selection of print PUL in their DIY store. But again, the fabric isn't quite as flexi as plain colour PUL. Though I haven't used Poly print PUL so I could be wrong! Some of the prints aren't my thing but there are a few gems hidden away in there. Oh yeah, and I'll ask on TNN about DIY laminating. There was a lady who was setting up in Oz but I don't know if she went through with it. I'll find out. i've thought about making nappies, too, but realistically, i haven't sewn anything even half as complicated in ages... i'm also feeling very negative about using disposable nappies, at the same time, if we're going to have a hard time with the baby, washing nappies might be just that little bit too much? plus we don't have the melbourne climate here in ireland, so getting them dry is going to be tricky! i've got muslin cloth squares, which i might try though, they would dry really quickly, just the cover would be tricky, there are cute patterns for knitted wool ones, but i'm not sure i'd trust them to really work... do you think you might make PUL covers for the etsy shop? thanks for all the feedback, folks! i settled on just making enough fabric covered ones to use up the god awful yellow pul, so i think i have four now. due to your alerting me of the wicking risk, i only use them for short daytime changes and haven't had any problems with them yet. péitseoga, the nappies REALLY aren't that complicated, i'm usre you could whip some up but, yes, drying them in the irish climate might be a bit of a struggle. i haven't found the actual washing of them much work because there is always so much other stuff to wash anyway - clothes that have been spit up on, blankets that have been peed on, etc. and i don't think i'll be selling any cloth nappy products. they were fun for me to make but i'd get too bored making them over and over again. i'm sure there are many other great ones available on etsy though!